The process to decide whether a 138-foot tall cell phone tower can be constructed at Crossfield Elementary School has been stalled. The Fairfax County Planning Commission, which held a public hearing on the application by Milestone Communication and Verizon Wireless on Sept. 28, was slated to render a decision on the issue Wednesday, pending the opinion of the Hunter Mill Land Use Committee. However, the land use committee deferred decision, so now the issue will have to wait. The issue is back on the planning commission docket for Nov. 16. The planning commission will either recommend the project for approval or denial; the application then goes to the Fairfax County Board of Supervisors for final approval. Many Crossfield-area parents spoke out — as they did before the planning commission in September — at the land use committee meeting Wednesday. The parents say radiation exposure 127 feet from the elementary school’s playground provides an unacceptable risk for the students, among other concerns. They also said on Wednesday that the Fairfax County Public Schools Facilities Department did not follow policy and overlooked multiple errors in the application. A county planning staff report recommends approval of the application, which Milestone says is necessary to fill in gaps in coverage in the areas off Lawyers Road, including Reston’s Fox Mill Woods neighborhood adjacent to the school. 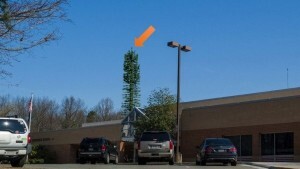 The pole, which would be built to look like an evergreen tree, would be able to carry signals from five mobile carriers. The pole would be on a 2,500-square-foot area surrounded by an 8-foot fence. Fairfax County Public Schools have towers on more than 30 properties, the vast majority of them are high schools and middle schools (including South Lakes High School in Reston). The cell phone companies pay the landowners to lease the pole space. FCPS, for instance, has made more than $4 million from the arrangement over the last several years, FCPS officials said. Milestone collects rent from the wireless carriers on its towers, 40 percent of which goes to FCPS. 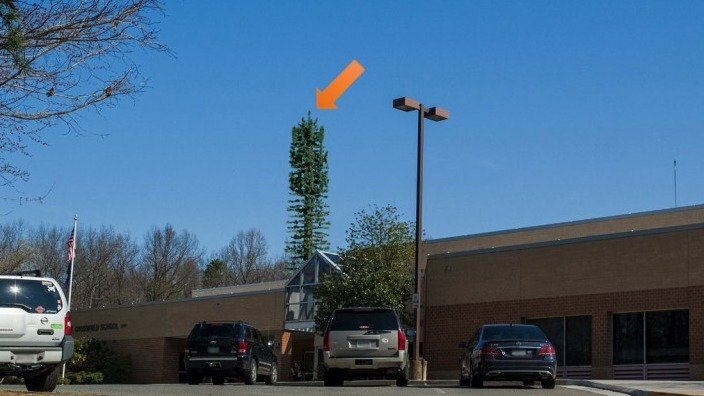 Schools receive $25,000 each time a tower is built, and then $5,000 from each wireless carrier that leases space on the tower. Photo: Proposed cell phone tower at Crossfield Elementary School/Credit: Milestone Communications.